Baked beans are always a great side dish for any cookout. 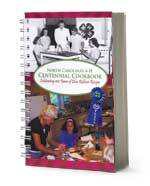 Try this recipe from North Carolina’s 4-H Centennial Cookbook. Preheat oven to 325˚. Sauté bacon and onion in vegetable oil until bacon is crisp and onion turns yellow. Mix beans, molasses, Worcestershire sauce, mustard, black pepper, and ketchup. Add cooked bacon and onion to mixture. Pour into a casserole dish, and bake uncovered for 45 minutes, or until beans are brown and bubbly. Top with pickle relish. Serves 12.